About Applewood Public School Applewood Alligator Originally built in 1978, Applewood has approximately 180 students from Junior Kindergarten to Grade 6, an educational team composed of teachers, principal, support staff, a youth counselor and a learning resource teacher. Applewood School proudly provides a rich and varied program in language arts, reading, math, the arts, social sciences, design and technology, and computers. Students participate in experiences and opportunities which encourage the development of excellence, integrity, tolerance, respect and a sense of social responsibility. Our teachers volunteer their time to organize and/or supervise extra-curricular activities for Applewood students and we enjoy a strong partnership with the School Council and our community partners. As a unified team we are committed to achieving the common goal of providing an unsurpassed educational experience for all of our students. Parents also serve on committees and assist with many functions where their expertise and support are invaluable. 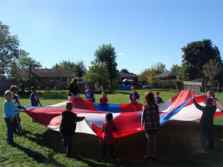 With the support of staff and parent volunteers, Applewood is able to provide numerous learning opportunities for our students. Originally built as an 'open concept' school, Applewood is undergoing renovations during the summer of 2009 to build enclosed classrooms. Officially opened Friday, Februrary 2, 1979.